The Labour Party has appointed US election strategist David Axelrod as a strategic adviser on leader Ed Miliband's 2015 election campaign. Mr Axelrod was a key architect of Barack Obama's victory over John McCain in the 2008 presidential race. He will work alongside shadow foreign secretary, Douglas Alexander, who is to run Labour's general election strategy. Labour will pay Mr Axelrod a six-figure sum and use his consulting firm AKPD in its bid to win power. After masterminding Mr Obama's election to the White House, Mr Axelrod went on to become a senior adviser to the president. Media captionDouglas Alexander, Labour: David Axelrod "used to fighting negative campaigns"
He quit the post in 2011 in order to work on the successful 2012 campaign to re-elect Mr Obama. The strategist has since acted as a media commentator and as a director of the Institute of Politics at the University of Chicago. Ed Miliband hailed the appointment as "excellent news" and predicted the strategist would be a "huge asset to our campaign as we work to show the British people how we can change our country for the better". David Axelrod is an A-lister amongst political backroom boys and hasn't come cheap: his services and those of his company come, I'm told, with a six-figure bill. His appointment - seen by Labour as a major coup - highlights the globalisation of British politics: an Australian, Lynton Crosby, is the Conservatives' election strategist; Ryan Coetzee, a South African, is the Liberal Democrat leader Nick Clegg's Director of Strategy. Each hired for what is seen as their own brand of international political magic, their challenge, as outsiders, is to ensure they fully understand the motivations, instincts - and peculiarities - of the British electorate, and a UK election. Mr Axelrod said he had been struck by the power of the Labour leader's ideas and the "strength of his vision". He drew a comparison between Mr Miliband's economic policies and the arguments articulated by Mr Obama in 2008, saying both have at their core "the experience of everyday people". He said: "I think candidates who can win are candidates who articulate a vision that speaks to the lives and concerns of the people they are running to represent. "Ed Miliband understands the struggle that people are going through in Britain to make a living wage, to support their families, to retire with some dignity. "He understands that a growing economy demands that you have broad prosperity and not just prosperity that's hoarded by a few. And so I think you can build a movement." Mr Axelrod is expected to travel to London for two days of strategy meetings in mid-May led by Mr Miliband and deputy leader Harriet Harman. After that he will participate in "regular" discussions with the team, the Labour Party says. David Axelrod is widely considered the man who steered Barack Obama to the White House. A former journalist who left the newsroom for the world of electioneering, he once told the LA Times that he went into politics because of his belief in idealism. He worked with a number of leading Democrats, including Hillary Clinton and former presidential candidate John Edwards. But it was his relationship with Mr Obama which proved the most fruitful. Mr Axelrod masterminded the Obama campaign that saw him become the first African-American president in 2008. And he returned four years later to work on Mr Obama's re-election. He is now director at the University of Chicago's Institute of Politics and says he is "proud" to make his political return to work with Ed Miliband. Mr Alexander, who will co-ordinate Labour's election campaign, told Radio 4's Today programme that Mr Axelrod would provide "significant support" in an advisory role. 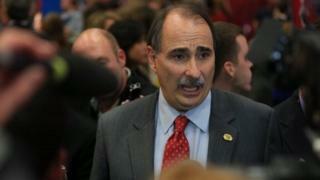 The general election campaign is likely to be negative, he said, and Mr Axelrod is "well used" to such an environment. "He is used to winning big majorities and he is used to discrediting negative personalised attacks", Mr Alexander said. "We anticipate this is going to be a tight election and a tough campaign and I can't think of anyone I'd rather have alongside me in the trench than one David Axelrod," he added. However, Labour peer Baroness Prosser, a former party treasurer, criticised the decision to spend a "six-figure sum on one person". She said she would rather see the money spent on providing better organisation around the UK to help get Labour voters to the ballot box. "No matter how brilliant the message, no matter how organised everything is at the top level, if we don't get people coming out of their houses and voting on polling day then we are not going to win," she told BBC Radio 4's PM programme. Mr Axelrod's appointment follows reports of a rift within Labour's ranks over how it should be positioning itself. Last month, Mr Alexander denied the party had sacked adviser Arnie Graf, another former US Democrat strategist. Fellow Democrat Stan Greenberg, who has been a pollster for former US President Bill Clinton and ex-Prime Minister Tony Blair, also remains on the Labour team. In August last year, the Conservatives confirmed they had recruited former Obama campaign manager Jim Messina to work on its 2015 election team. As with Mr Axelrod, Mr Messina is not leading the campaign on the ground but remains in the US and "reports in to the Conservatives' senior management team".